This is just a simple burger generator using a pseudo-random value generator to add ingredients, generate the number of calories according to, and showing a testimonial from an happy customer who had the chance to taste this famous burger. 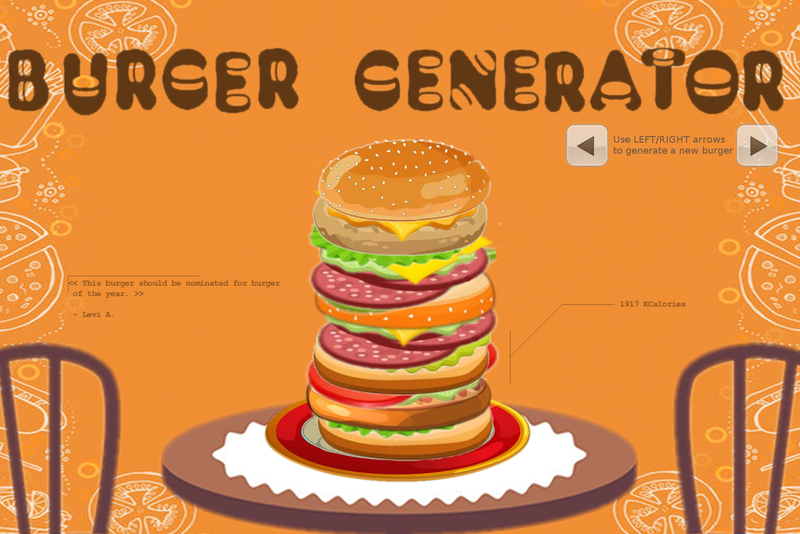 Simply use keyboard LEFT and RIGHT arrows to generate a new burger. This game contains graphics picked up on the Internet. So we are pretty sure they are not free to use but we are not here to sell a product but just perform a piece of code for a Proc Jam ^^. Please forgive us. The Mercurial(hg) software management repository is available here. The GFX are not supposed to be useable freely. The full code is under Creative Commons BY-NC-SA 3.0 (Attribution-NonCommercial-ShareAlike 3.0 Unported) - 2018 - RPH Studio. Awesome. This game saved my life!! Thx mate ! Hope you enjoyed your meal ! Don't forget to practice sport daily ^^.